Marguerite d'Angoulême, daughter of Charles d'Angoulême, comte d'Orléans, and Louise de Savoie and brother of the future Francis I, spent her childhood in Cognac, then at Blois. Her education was extensive, and she read widely in classical philosophy and the Scriptures. In 1509 she married Charles, duke of Alençon. In 1515, her brother Francis took the throne, and Marguerite joined him at the court. After a series of military campaigns in northern Italy, Francis was defeated at Pavia in 1525 by Charles V, Holy Roman Emperor, and taken prisoner to Madrid. Marguerite traveled to Madrid and negotiated her brother's release for a high ransom. Her husband died in the same year. In 1527 she married Henri d'Albret, king of Navarre, with whom she had one daughter, Jeanne, later the mother of the future Henry IV. Marguerite continued her political role at her brother's court, but she devoted much of her energy and attention to spiritual matters as well. In 1521 she began a correspondance with Guillaume Briçonnet, bishop of Meaux, who introduced her to the evangelist movement and the call for reform within the Catholic Church and a return to the original purity of the Scriptures. 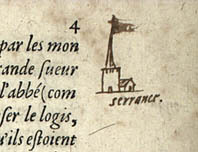 Briçonnet, along with Jacques Lefèvre d'Etaples, shaped Marguerite's religious beliefs, and she in turn encouraged reform within the church and the need to reinterpret the Scriptures and translate them into French. She herself habitually retired to meditate and pray, and composed numerous works of devotional poetry, including those published in the Marguerites de la Marguerite des princesses (1547). 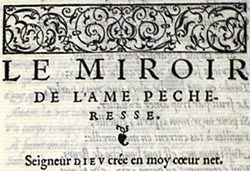 Her Miroir de l'âme pecheresse, first published in 1531, then again as the first poem in the Marguerites (1547), provoked the censure of the Sorbonne theologians for its expression of ideas associated with the religious reform movement. Eventually, Marguerite withdrew from the world of politics and diplomacy more frequently and spent longer periods of time in the serenity of her various chateaux in southwestern France. Along with her works of spiritual poetry and theater, Marguerite began writing the novellas she envisioned would compose a French Decameron. 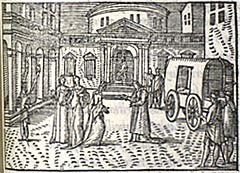 She died before the project was complete, leaving 73 novellas that the editor, Claude Gruget, entitled the Heptameron (from the greek hepta, "seven") in his 1559 posthumous edition. Inspired by the Italian predecessor's model, Marguerite develops and animates the fictional frame around her novellas much more than does Boccaccio. The great diversity of stories and the often contradictory opinions of the "devisants" who tell and discuss them reflect the complexity of human nature, the coexistence of good and bad in the world, the abyss between the spiritual and the material, and the dilemma of how to face that abyss.